In Magento there are three types of product relations: Up-sells, Related Products, and Cross-sell Products. Two of them appear while viewing a product, and one usually appears in the shopping cart. Up-sells for a product are items that you would like your customer to buy instead of the product that he is viewing, and they are pricey, better quality, etc. Related products also appear in the product info page, but they are products that are meant to be purchased in addition to the one that the customer is viewing. Cross-sell items can appear both in the product page and in the shopping cart but they are a bit like an impulse buy – similar to items at the cash registers in grocery stores. As it’s already mentioned, up-sells are meant to get customers to spend more money buying a model of the same type of product that is more expensive, to add some features to it, etc. 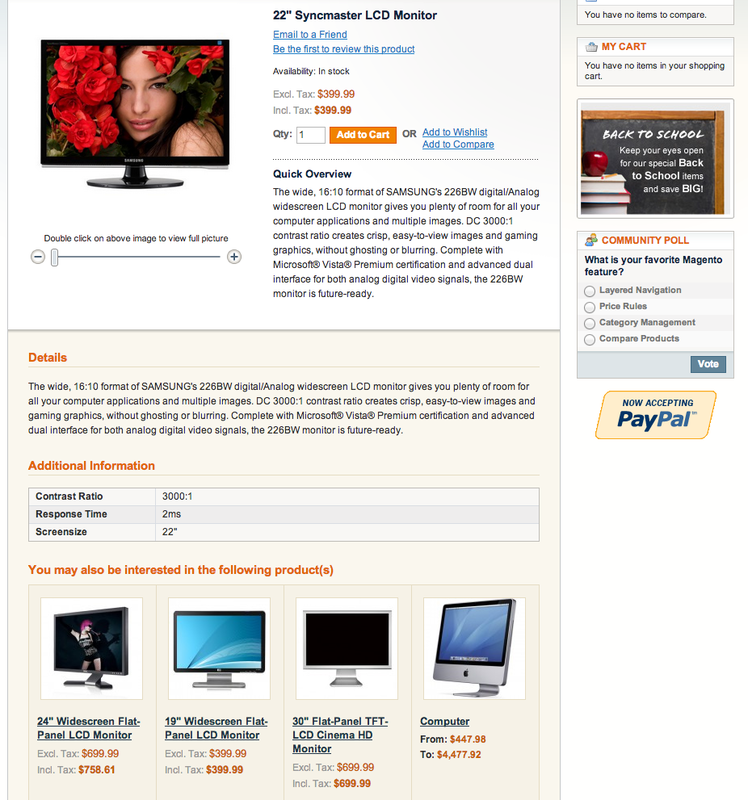 This is an example of the Up-sell created in Magento demo store. Situation in which customer wanted to buy cheaper monitor so you suggested him some more expensive ones. This product recommendation is based on the product your customer is currently viewing and it intends to make customer buy more products including the one that he wanted in the first place. 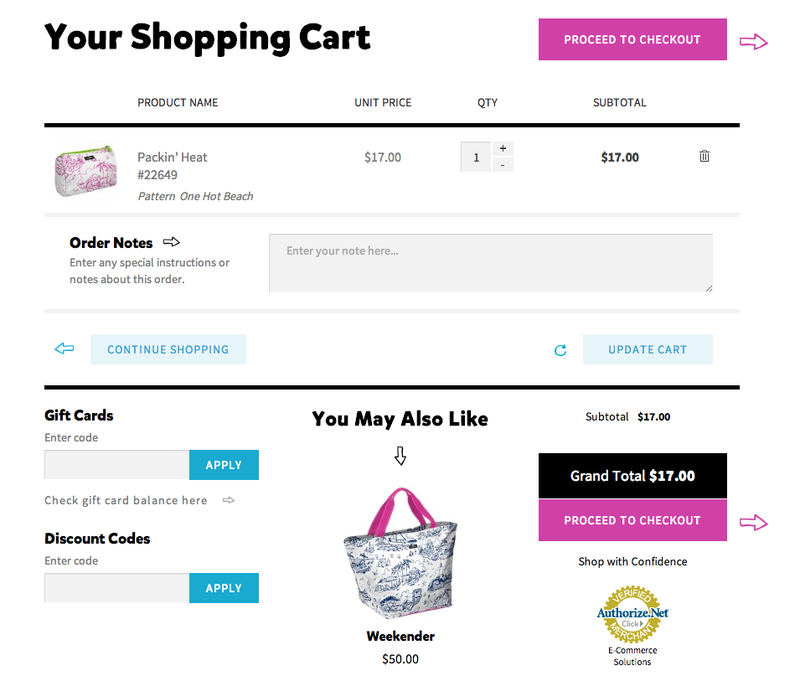 In this case, products usually come with checkbox to make it even more easier for customer to add items in the cart. Of course, if the product is configurable, checkbox cannot be used because the configurable attributes must be defined first. Cross-sells are usually displayed in the shopping cart page, ie. after a product has been added to the cart but sometimes that’s not the case. This functionality is intended to make customers buy items they didn’t had in mind when they came to your site. It’s really similar to all those items you see at the cash register in stores that make you to buy something impulsively. To sum up, main difference between up-sells, cross-sells and related products is that up-sells point out products that are improved versions of the one your customer wanted to buy (ie. more expensive) and the other two are there to make customer buy more products including the one he came to buy. Related products through items that are related to the product he wants to buy and cross-sells with products that aren’t actually related to the item but it’s likely that customer will be interested in them (based on the one he wants to buy). Usually, product recommendations are combined and sometimes up-sells and cross-sells are actually “hidden” within related items. But, on the other side, they can be divided with labels as: “Want to Upgrade?” for up-sells and “More Recommendations” for related/cross-sells. This will also allow you to track what types of suggestions are more effective. How are you going to present all those recommendations to your customers is really up to you. Some common labels are: “You may also be interested in the following product(s)”, “Complete the look”, “May we suggest…”, etc. It’s recommended to use labels that clearly communicate why are products being recommended (eg. “People like you liked this”, “These are top then sellers in this category”) than to use just “We recommend”. Note: This is a revamp of a post from 28 August, 2008. Alternatively, you can always contact us – we would be happy to help you set your product relations right and get your store in the perfect technical, UX and SEO shape! Do these related products etc have an affect on page speed? Is this completely static/ manual and is there any way to actually track the conversions from these recommendations? i try to change in horizontal but i dont find the ride way . What about cross sale products that need attribute selection upon add to cart (for example – select color). Is there a workaround to enable selection of attribute and then add to cart from cart page instead of native magento click to visit product page upon add to cart and then select and add to cart? Hi. I am looking for same solution. Did you find any? Thanks for the post Biljana! All these different features have different aims weither it is increasing conversion, customer retention or increasing AOV. While on the subject of recommendations I wanted to take this opportunity to tell you that Nosto has today been named one of only 15 Magento Gold Technology Partners in the world and in conjunction we have released a major update to the Nosto Magento extension which is already in place in over 350 Magento stores. Nosto allows retailers to get up and running with personalized product recommendations within minutes, faster and easier than ever before on Magento. Check out the extension here http://www.magentocommerce.com/magento-connect/nosto-saas-recommendation-engine.html and try it out for free for 14 days! Is it possible to show the cross sell products, in the order success page in magento? I have successfully implemented upsell products on product page with qty and add to cart button. But my problem is: when a customer adding upsell product into cart and go back to main product page , upsell product not visible but if the customer adding main product into cart and back to product page, upsell product is still visible , any idea? Thanks for the post. How do you change the heading name from Cross Sell Products – and Upsell products to something else. Where do i make this adjustment? Hai,…go to app->design->frontend->your theme->default->template->catalog->product->list->upsells.phtml……and edit the text in it ..
Great article. Adding this to our Magento sites will indeed improve sales. 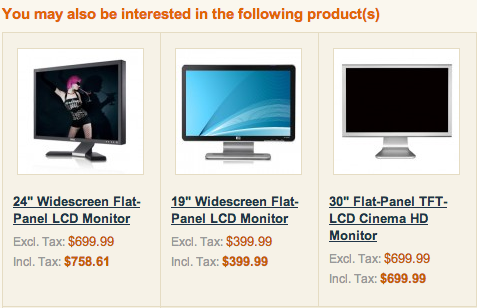 I agree with needing to have quantities seen before adding cross-sell, up-sell, or related products. Hello to everybody! I’m searching for a way to assign related products, up-sells and cross-sells automatically. Can you recommend any extensions(i’m not a developer)? For now I found this one http://amasty.com/fast-product-relator.html? Could someone tell me a reason why all of a sudden I can’t edit (add/remove) any products to Related, Cross Sell or Up Sell Products? It confirms it has saved the product but when you return they all have disappeared. Maybe not the right topic. but does anyone know if it is possible to show the product stocks of upsell, related and cross sell products in the magento backend. I want to see if a upsell is in stock when i add it to a product. So i need to edit the table in the tabs. can’t find anything regarding this topic. Hi, any one know how could i display recipes(in food website) as an add-on(add-on may represent full product), should i create a recipe as an product and attached with original item as an related product or is there any other batter way for that? when i check to include a related item, and then change the qty of the main item I want to buy to 5, when I click add to cart, shouldn’t I also have qty of 5 of the related item? i want to display related product on separate page.i have to add link named “Related Product” on product description page.when someone click on it all related product associate with that product display on new page. we have send product id so we get different related product as per different product. It’s good! Thanks a lot. Is it possible to show the related products like the upsell in the Magento template (center column)? Nice Post. If you are looking for code in Magento to link products..please see..
You an buy/read the Magento user guide, where it is explained. I think you should post about Configurable Products. I have a main product and but it comes in different sizes and related prices. I’d like to list all different sizes AND prices of the same product. In other shopping carts, a main products with variances are called subproducts and I’m attempting to create subproducts in Magento using the Configurable Product option. Please email me if you have a solution to this issue.